Variety is something to be embraced while riding off-road. The Tokul is designed to attack both the ups and downs found on today’s newer bike specific trails. With a roomy cockpit pedaling is made easy, while the longer travel fork and slackened geometry propel you down the trail. 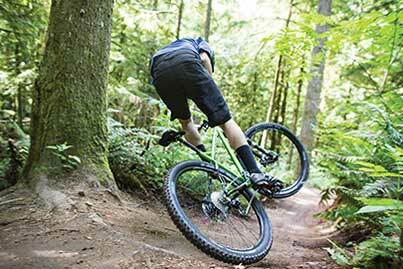 Versatile and playful these bikes are created to be more than your average hardtail. 27.5” wheels marry the benefits of 26” and 29er wheels. This tweener size is incredibly versatile in the varying conditions found on trails. It’s capable of rolling over rocks and roots with ease just like the larger 29er wheel, yet nimble in hard to navigate situations. These elements combine to make a wheel adept in any kind of terrain and in all conditions. The 4130 Chromoly used to construct the frame provides a durable and compliant platform for trail use. We decided that a Shimano Zee drivetrain paired with an MRP All Mountain Guide would be the perfect solution for simple and dependable drivetrain. Spec’ed with a Fox 130mm CTD fork rough terrain is ready to be conquered. The 6061 alloy used to create the frames provides a stiff and durable platform for trail use.TheTokul’s geometry gives the bike a stable yet agile ride. A low standover height and slacker headtube angle make rough terrain simply easier to navigate. When it comes to lifting the front wheel over objects on the trail the Tokul’s short rear-end allows you to wheelie with ease.This shorter chainstay also keeps the bike responsive in tight corners. A low bottom bracket centers your weight low in the bike making it easier to track in the corners and maintain control at speed. Altogether, this concoction produces a bike capable of inducing the addictive ride that keeps you coming back for more. We gave the alloyTokuls 120mm-travel forks for more control over rougher terrain.This unique spec provides the added suspension that makes these bikes even more capable of taking on challenging terrain. More fun is the end-goal and more travel helps get you there. 27.5 marries the benefits of 26 and 29er wheels.This tweener size is incredibly versatile in varying trail conditions. It’s capable of rolling over rocks and roots with ease just like the larger 29er wheel, yet nimble in hard-to-navigate situations.These elements combine to make a wheel adept in any kind of terrain and all conditions. TheTokul series has all-new light and stiff wheels with better hubs and wider rims. 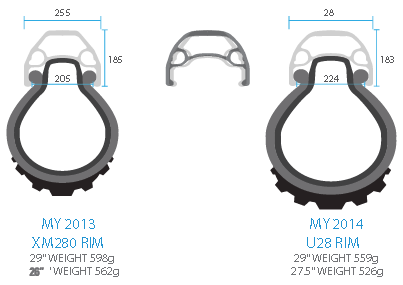 We gave them U28 disc-specific mountain rims that are 28mm wide.The wider rim cross section increases the tread contact patch and allows riders to run lower tire pressure, with less tire roll. Riders will be able to find more traction while cornering and corner with more confidence.You’ll find trail-ready Kenda or Schwalbe tires on our new wheels so you can continue to push the limits of traction. We chose a wider bar at 720/700mm, with a 15mm rise to make the front end easier to get up and off the ground. A wider bar also helps keep you stable while navigating technical terrain and handles better at speed.To accompany these wider bars, we went with a shorter stem for better front-end handling.The combination of this stem and bar give you a playful advantage when the going gets tough. We don’t want the components to hold you back so, we’ve selected size-specific bars and stems per model. FPD Sealed Bearing Ahead 1-1/8"